The notch is fine but we've lost where we used to look for information on screen because of it. Most of that can be found in new places if you know where to look yet it's far less convenient than it was. Since the iPhone X introduced the notch, all of the fuss has been about how it looks. Some people don't even notice it, some keep being drawn back to it, other companies have copied it. Yet even as it's the most visible feature to tell the world that you have an iPhone X series device, it's also lost a lot of information. Before the iPhone X, that status bar used to show the name of your carrier and then a startling 26 different other pieces of useful information in icons. Today it's hard to count the icons because they do vary depending on carrier, territory and whether you're on WiFi or not. However, there are certain icons we used to rely on that are no longer visible. And when you first realise that they're gone, you spend an age in Settings trying fruitlessly to get them back. That's a status bar from the iPhone XS Max, the biggest iPhone that Apple makes. Whenever you take a screen grab from a X series iPhone, you don't see the notch because Apple lets the background image fill in that gap. Even so, you can see the wide space between the icons: they're clearly now ranged right and left with nothing in the middle. So take that image and tell us: is this iPhone playing music? Is it playing that music over headphones? What's the battery percentage? And is it on VPN or not? This is all information that you used to be able to see instantly. And that's why you never tapped Play and discovered that your AirPods weren't connected. It's why you never had to remember whether you switched on VPN before you did online banking. And while it's probably bad for us to keep staring at the exact battery power percentage left, we used to find that useful. Certainly it's a lot clearer than Apple's range of icons that just show a steadily depleting battery with no sense of how fast it was dropping. You can't get this information back into the status bar permanently but some of it does appear fleetingly. When you first connect to VPN, the status icon appears in the top right part of the status bar before sliding out of view. Similarly, if you connect AirPods then the headphone icon appears for the same brief moment and with the same animated slide out. If you happen to look at the screen at the right moment, then, you see these icons. You just can't tell later whether the headphones are still on, if the VPN is still connected. And options we previously had about choosing a percentage as well as a battery icon are gone. Swipe down from the right hand side of the status bar to call up Control Center. 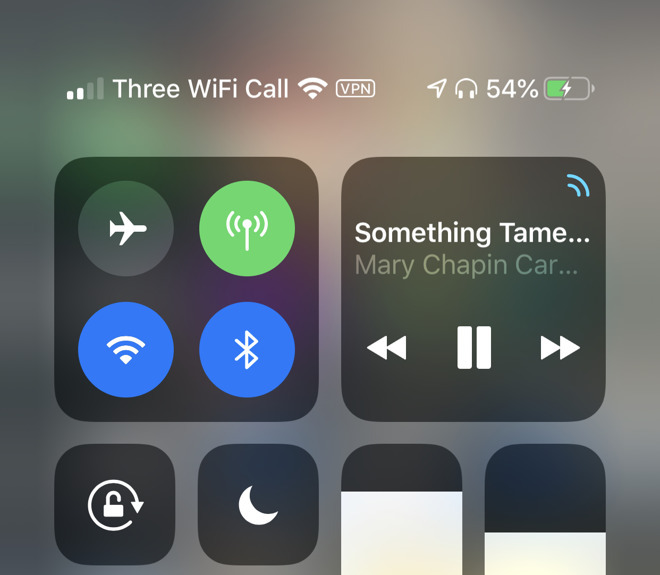 Atop Control Center's regular icons for WiFi, Bluetooth and so on, there is now a new status bar. There you go. VPN, headphone connectivity and a percentage battery indicator, just like we've always had —and just like you've not noticed since upgrading. This isn't a complaint about the notch. It's not even really a complaint about how it means we can't have as many status icons as we did before. However, it is a complaint that we have no choice in the matter. Look at that first example status bar again. On the left, that status bar is showing us the time, the fact that some app or apps may use Location Services but right now none are. On the right, it's got carrier signal strength, WiFi strength and a battery icon that has changed to show that the phone is being charged. We'd like to change that battery icon so that it shows a percentage instead. We'd be fine not knowing moment to moment what our signal strength is, we could check that before making a call. Or we could just make the call and figure out for ourselves whether anyone answers. Similarly, location services is interesting when something is using it but we don't require the information unless we're troubleshooting why our battery is going down so much. Whereas knowing if VPN is on means knowing we can do online banking. Knowing the AirPods are connected means knowing our iPhones aren't going to play loud music for everyone around us. So we'd like at least some option to choose what we see in the status bar and what we don't.